Adding noise to an image adds hight frequency components to it. High frequency components are those that are responsible for image sharpness, i.e., pixel to pixel distances. In other words, the smallest components of the image like edges. On the other hand, blur removes high frequency components from the image. 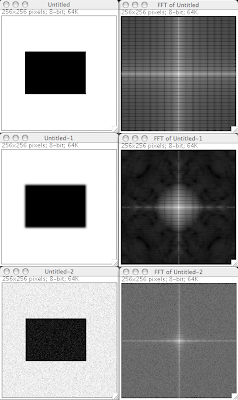 Bellow, the picture presents image (left column) and its Fourier transforms (right column). Above Fourier transforms were calculated using free ImageJ software.